Content strategy is about so much more than streamlining your content development process—it's about supporting your organization's business goals. To be truly effective, your content strategy should be global. That means breaking down the barriers that keep the different types of content producers in your organization apart. Your organization creates various kinds of content—technical, marketing, training, and more. Your content strategy may begin with tech comm, but it should also account for these other types of content to present a unified message and better serve your brand. This presentation shows how, with a global strategy, all of your content can work together to help your organization succeed. Gretyl Kinsey is a technical consultant with Scriptorium Publishing who specializes in content strategy and tech comm tools and technologies. Since joining Scriptorium in 2011, she has been involved with the development and implementation of content strategies for organizations in a variety of industries. She has experience with every step of the implementation process, from customizing transforms to converting legacy content to helping with follow-on support. She also frequently contributes her graphic design skills to the marketing side of Scriptorium. With a background in journalism and visual communication, she is interested in the convergence between technical and marketing communication, and in content strategies that encourage it. 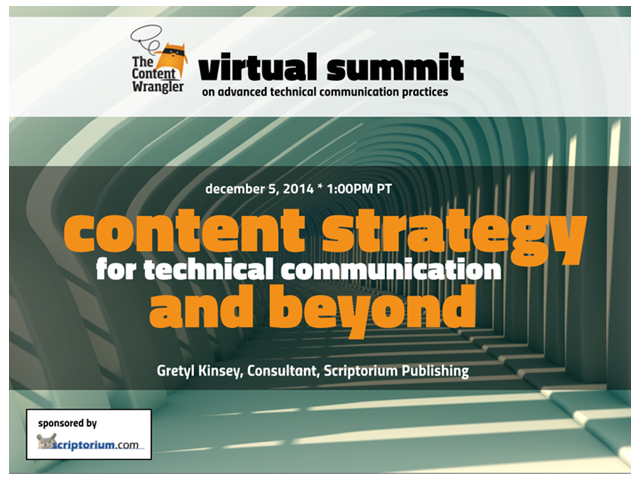 This session is part of The Content Wrangler Virtual Summit on Advanced Technical Communication Practices, December 4-5, 2014. Hosted by BrightTALK. Sponsored by SDL, Astoria Software, Acrolinx, oXygen XML Editor, Logos, Scriptorium, and Oberon Technologies. Recording available to those who register.